“This is what I’m talking about,” I said holding up a basket of fresh blackberries from our most recent Off the Vine share. “How about these,” Kath responded holding up a pint of beautiful tomatoes. “I see bruschetta in our future, ” I replied. “Here’s a bag for roasting if there ever was one, “Kath declared as she pulled carrots, onions, and beets out like a magician hauling a rabbit out of a hat. 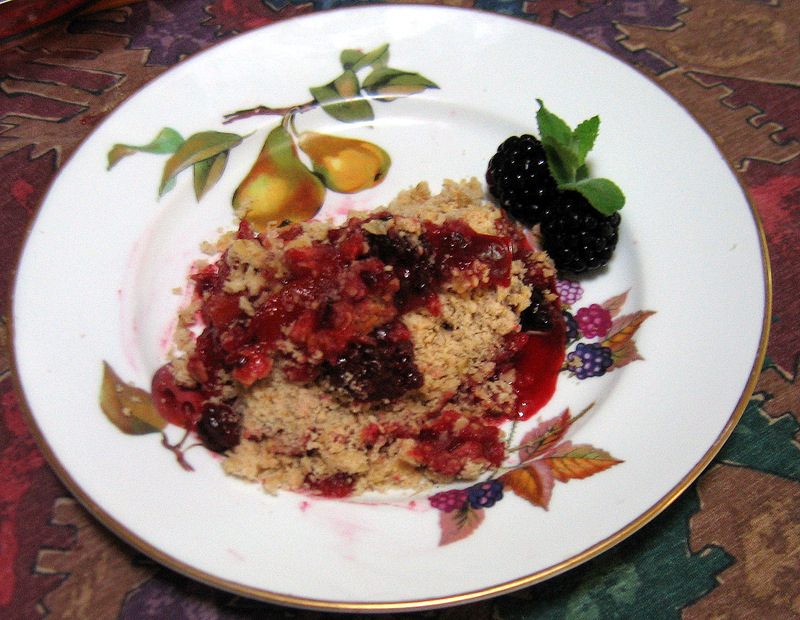 Popping one of the blackberries into my mouth, I mused over the dessert options, combining them with peaches from out last share and fresh plums from the trees in our front yard. Visions of tarts, turnovers, crumbles and cakes danced in my head. Yes, this is a very good time of the year to be an Off the Vine member. And, just when you thought it couldn’t get any better, melon season is just around the corner. Preheat oven to 350°F. Toss plums, remaining 1/2 cup sugar* and brandy in medium bowl. Transfer to 9-inch deep-dish pie dish. Sprinkle crumb topping over. Bake until fruit bubbles and topping browns, about 1 hour. Cool slightly. Serve with ice cream.